I have been quiet about the aftermath of Hurricane Katrina on this blog. I did call the Feed the Children number at 1-888-58-CHILD today. They were professional, courteous and quick. I was able to go through the whole process of donating in about a minute. My only additional comment on the aftermath is that the screeches of local politicians are way out of line. If they want blame then get a mirror. Louisiana politics has been one of the most corrupt and incestuous in the nation for decades. Single Party rule inhibits leadership and accountability. In New Orleans, local officials had a near scare about this very scenario last year during hurricane season. The mayor and governor are the first and second lines of preparedness and they failed to plan. Compare Rudy Giuliani and his reaction to 9-11 with mayor Ray Nagin of New Orleans and his failure to lead his city. This politician is a failure as a man and a leader. 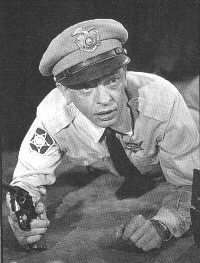 Barney Fife would be an upgrade for this community in crisis.